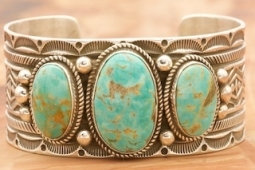 If you have 'Candelaria Turquoise Bracelet' in your shopping cart go to View Cart at the top of the page to check out. If you are having any problems with the checkout process we are here to help. Call us toll free 1-877-892-0297 to place your order. Genuine Candelaria Turquoise set in Sterling Silver Bracelet. Created by Navajo Artist Geneva Ramone. Signed by the artist. Candelaria Turquoise comes from the large Candelaria Silver and Gold mine in Nevada in an area not to far from Tonopah. It is currently closed with no mining activity and as such Candelaria turquoise is rare and considered a collectable. The turquoise in this area was usually found in thin veins and is known for its beautiful almost electric blue stones, sometimes with a light matrix. Over the last few years Candelaria turquoise has been seen again in today's turquoise market from older collections with beautiful dark blue stones with a beautiful matrix pattern and has now been cut and is appearing in fine jewelry. This mine produces some of the most unusual and beautiful patterns, no two stones are ever alike. The center turquoise stone is 1" x 5/8".